I chanced upon 2 books by Indian authors on food in India. What better combination, a book on food, especially for a foodie and avid reader like me. 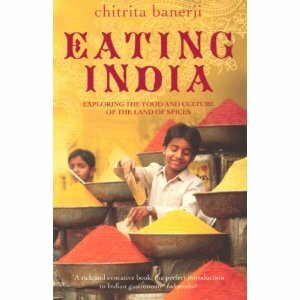 Eating India : An Odyssey into the Food and Culture of the Land of Spices. The book had me hooked from the very beginning when the author starts to describe a Bengali wedding – something that was so much a part of my childhood, where we had Bengalis as neighbours, friends, family friends, dad’s colleagues. The book is a fantastic journey into the cuisines of various parts of India, exploring the possible origins of dishes, the foreign influences that made what we eat today, so part of Indian cooking. So many ingredients that we take for granted today, was part of what we got from various parts of the world, like potatoes, onions, and even the Bengali Rossogolla, might have other origins, which the author tried really hard to track down in the book. The author’s love and appreciation of food, irrespective of cuisine, comes through in her writing. Her descriptions so vivid, that she made some of the food, which I actually, don’t like, sound delicious. For me, it was a wonderful read and also made me want to try out the variety of cuisine that our wonderfully diverse country has. I picked up this book on a whim. The cover looked good and so did the synopsis. I am happy to say that it did not disappoint. The author takes us down the memory lane with her reminisces filled with food, along with the recipes. Starting from her initiation into eating adult food( Chor-unnal in Malayalam) to the time that she is married. Each memory associated with some sort of food. Be it the food that she shared with her school friends , her cousins or her roommates, while in college. The flavour captured beautifully in her words. How food was so central in everything that she has done. Even the permission to go abroad for higher studies was based on the fact that she was able to churn out a wonderful traditional meal. She talks about the time when she tried fusion food (international fusion at that) on her husband, much to his distress, all he wanted was an authentic South Indian meal. It was a wonderful read, though I am too lazy to try out recipes, reading was soul satisfying enough for me.